AP Block Technology Managers 35 Posts Recruitment Notification. 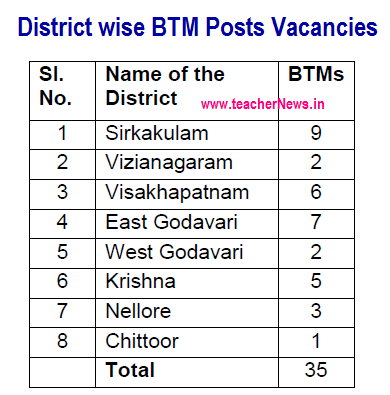 ATMA Block Technology Managers ( BTM ) Posts District wise vacancies and Application form / Bio data form, Selection Process, Last date apply, Educational qualification, How to apply ATMA Block Technology Managers Posts and Postal Address Download. BTM Posts Remuneration/ Salary details. Director of Agriculture and State Nodal Officer ATMA, Andhra Pradesh, Guntur is appointing (35) Block Technology Managers (BTMs) in ATMA Programme in 3rd spell in different districts on contractual basis. Government of Andhra Pradesh Director of Agriculture & State Nodal Officer (ATMA) Andhra Pradesh, Guntur F.No. AP ATMA /BTM/ 2016 dt: 09 -12-2016. Block Technology Manager (BTM) : Graduate in Agriculture/Allied Sectors with (3) years field experience with computer knowledge or Post Graduate in . Agriculture/ Allied Sectors with (2) years field experience along with Computer Knowledge. 1. Recruitment will be as per the number of post available in the respective districts. 2. Preference will be given to local or native candidates of the concerned districts. 3. If no local / native candidate is available in the district, the candidates of concerned zone and then State level will be given preference. Candidates have to work in the appointed districts and no transfers are considered in future. .
4. Preference will be given to the candidates having higher qualification and field experience. 5. Selection is purely based on merit, preference will be given to ANGRAU Graduates/ Post Graduates. 6. The appointments are purely temporary, the candidate can be terminated at any time without prior notice. Block Technology Manager (BTM): Rs.25,000per month ( Consolidated). 11 months from Date of appointment (continuation of the candidate will be depending on continuation of the scheme and performance of the Candidate..
*Note: AP ATMA Block Technology Managers Posts Recruitment Reservations for Scheduled Castes/ Scheduled Tribes and others as per norms will be followed. The Director of Agriculture, AP, Guntur is empowered to reject any application on what so ever reason. Interested candidates may apply for the above posts duly giving bio data in prescribed Bio - data form along with Xerox copies of relevant certificates and submit their application in Below Address. Last Date of Submission : before 5.00pm by post or in person on are before 26-12-2016.